This is a new idea I have for a blog that deals with ten different topics. In each topic, I am not allowed to write a large deal, so I must confine each post to only get the details. I will try posting these every once in a while because I think they will be interesting to read. Sometimes I feel as if I leave out the Hermit Crab Association too much! The HCA is a great online crabbing community where crabbers can talk about a multitude of crabby topics. If you aren't a member there and you have hermit crabs, I suggest you make an account! Be sure to say hello to me there! I'm known as Kilimanjaro. One of my most admirable hermit crabbing friends let me on this site secret a while ago. Mountain Rose Herbs is a great site in which you can find all types of hermit crab foods. All of the products are in bulk so the prices may be a little expensive, but if will last you a long time. Some good products to buy there are spirulina, bee pollen, raspberry leaf, and a variety of different flowers and seaweeds. This is one of my favorite things that I am seeing throughout the crabbing community! 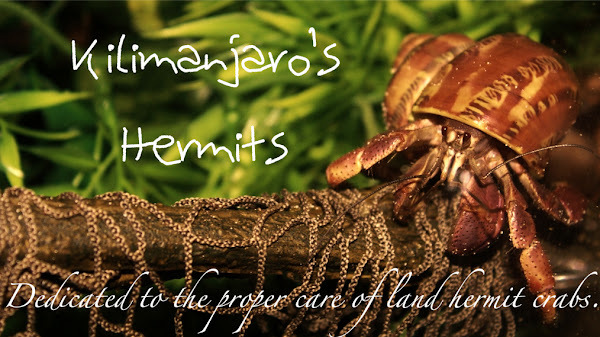 Exotic land hermit crabs are becoming more popular throughout the world. This is a bit of a double-edged sword, however, because it means more inhumane conditions and harvesting. If you're interested in exotics, check out some pet stores near you and see if you get lucky! Hermit Crab Vendor is a site that has just come to my eyes a little while ago. Apparently, the site is a wholesaling place, but if you email or call, you can place a smaller order and get species such as Violas and Straws. LiveHermitCrabs.com is a website that sells small orders of land hermit crabs to serious hobbyists. Albeit being a bit expensive, one can order a multitude of different species from this website. However, shipping details and contacting them can be little difficult at times, so be sure to place your order and know how much you are spending to avoid being ripped off. This is old news, but it deserves a blogging ovation. The Happy Hermit Crab foodstore is sadly out of order as of a while ago. The owner had a plethora of other life matters and had to set it aside as of now. Hopefully, she will be able to re-open another time! We all loved your foods! Because of the shutting down of THHC, I do have other sites where one can purchase food. Some of these places include, but are not limited to: Hermit Crab Addiction, The Hermit Crab Patch (formerly known as The Crabbage Patch), and El's Shells. Happy Eating! One of my newer Ruggies molted! I found his sharp toes today! This comes as a good surprise to me because I lost one crab due to molting (RIP Pompeii) and one lost a big pincher, who is currently down molting now. In addition to the Rugster, I have my Viola molting at the moment, too. This is very nervewracking to me because of my previous bad molts! I am really hoping he comes up healthy and looking great! 5. Shrimp, 4. Coconut, 3. Earthworm Castings, 2. Bee Pollen, 1. Spirulina! All of these foods are extremely healthy for land hermit crabs! And finally, get out there and harvest! If you haven't visited the Harvestables page before, I suggest you read it! Summer is a great time for harvesting! Please remember to stay away from any pesticide or chemically sprayed areas! Harvest only where it is allowed and is organic! Happy Harvesting!